Our team will be running to raise awareness of Neuroendocrine Cancer - sometimes called NETs or Carcinoid. There are nearly 170,000 people in the US living with some form of this cancer. Every day someone in the bay area is diagnosed with a NET. To learn more about the running festival and why it was voted the Best Marathon in the Pacific Northwest click here. NEWS FLASH: Over the last 7 years NorCal CarciNET Community has had over 400 runners partcipate and raises over $60,000 for the Neuroendocrine Community. Click on photo for full screen. Click here to see nearly 200 photos of the day. In 2013 Todd Lloyd ran in the running festival raising awareness and $3,000 for NorCal CarciNet Community. Click here to read more about his run. Every year we have grown our team, in 2019 we had 125 participate in the event, running, walking or just enjoying the day. Our team needs runners and volunteers to help raise awareness of this disease. 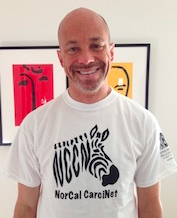 It started in 2013 with one man - and one vision - to wear a NorCal CarciNET shirt at the Oakland Running Festival and raise awareness of NETs, a disease that his friend and neighbor was fighting. From one zebra in a sea of 10,000 we have grown and have had over 100 participants since 2017. In 2019 we placed 5 runners in the top 5 of their age/gender category including a Top 10 overall finisher. March 21, 2020 - We need volunteers to help staff expo day for the Oakland Running Festival-- Many Shifts are Available -- The running festival runs on volunteers - if you have time on Saturday, please help us fill our volunteer commitment. March 22, 2020 - 5k, half marathon, team relay and full marathon. Runners will each receive NorCal CarciNET / Oakland Running Festival T-shirts, and some extra goodies in their NorCal CarciNET goodie bag as well as a shirt from the running festival. Participant can also elect to set up personal contribution pages to raise money for NorCal CarciNET in conjunction with the Oakland Running Festival. Interested in donating to our team? Several of our runners have set up fundraising pages to raise money for NorCal CarciNET Community. Over the past four years we have raised over $20,000 during the Oakland Running Festival to support our programs.